Bespoke Fishing Products From "Art Of Angling"
A recent new venture for me has been to work with another Norfolk resident, Paul Cook, from Dereham. 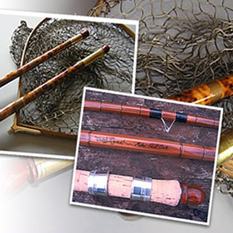 Paul makes a range of split cane and hollow cane fishing rods as well as a range of beautifully decorated floats and float tubes. Paul also restores cane rods, plus many other related items of fishing tackle. Paul has also published his first book, "Lost in a Quiet World". You can find out much more about Paul's work by visiting his website here. 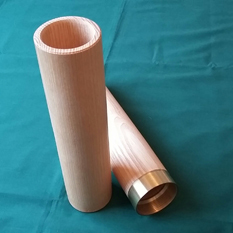 My initial involvement with Paul is to make blanks for him to use in the manufacture of finely decorated float tubes. Here you can see the first pair of prototype tubes ready for decoration by him. They are turned from Ash to very fine tolerances. Long term I hope to get involved in several other projects with Paul, watch this space. Here you can see three more tubes made for Paul, they are slightly slimmer than the first pair. The two on the left are Ash, whereas the one on the right is a mixture of Ash and Spalted Beech.